I was born in the Borough of Hornsey in North London on December 16th 1922 and christened Arthur James Humphreys. My family know me as Arthur but in adult life and with my own family I am known as Jim. I left school at the age of 14 and worked for an electrical contractor in Crouch End. After the Munich crisis it became obvious that the country was heading towards war. Initially I tried to join the Auxiliary Fire Service but, because of my age, I could only be employed as a runner, not the exciting life of helping young ladies in distress. I turned to the territorial army (putting an extra year on my age) and joined 284 Battery, 90th (Middlesex) HAA Regiment RA.TA. The unit's training area was in the grounds of Alexandra Palace, immediately below the BBC Television building. In fact, while at school, I had watched three steeple-jacks construct the transmitting aerials which, as far as I know is still standing proud on the skyline. The unit mobilized on August 24th 1939 and the regiment moved to various war stations. Our battery, because we had not at that time attended a practice camp, went to a tented camp in Essex. We were taught about small arms, in particular the Lewis Gun. That knowledge came in useful when the battery was posted, in October, to defend Brooklands. At that time it was a world famous motor racing track and the central area was used as an airfield. Two large factories existed on the perimeter, Hawkers making Hurricane Fighters and Vickers making Wellington Bombers. The unit's task - to defend the area against possible enemy air attack. Our weapons - eight Lewis Guns and one WW1 water-cooled Vickers machine gun. We constructed gun pits and settled down to do the job. Lucky for us, and for everyone else in the district, the Luftwaffe didn't come. As far as the mainland was concerned this was our `Phoney War' period but it wasn't the case over the seas, several Wellington bombers returned for repairs having been shot up by enemy fighters. The guns were only manned during daylight. For meals and sleeping we used existing restaurant buildings at the top of the `Test Hill', a one in three gradient and I can tell you that we were very fit after all the marching and hill climbing. The weather turned extremely cold and this was the only place, during the whole my service, when a rum ration was issued. I was given a new job - telephonist and I with five other lads manned the two position keyboards located in the clubhouse. This meant that we had to sleep nearer to the job and took over the, so called, `Press Hut'. We still needed to climb the hill for meals but, because of our flexible twenty-four hour manning, life became easier. The unit moved, in December, to Wales for our first practice. Incidentally the Brooklands Museum, near Weybridge in Surrey, is well worth visiting. The Press Hut has been opened as an exhibit but you will not find a plaque stating that `Jim Slept Here'. The first six months of my service. I was working for a small electrical contractor in Crouch End and had joined a unit of the Territorial Army in March 1939. One of my jobs for the firm was the collection of goods from wholesalers and I was doing this on Thursday 24th August. As I cycled back from a warehouse in the City of London I could not help noticing gentlemen rushing from buildings and jumping into taxicabs. Recent news reports had been full of the possibility of war with Germany. Were these, obvious military types, being called up? Would my own papers await me when I got home? Sure enough, when I went into the living room, there was a telegram resting on the mantelpiece. �Join at once - OC 284� Mother insisted that I had some tea before changing into khaki and setting off with all my kit. I took the tram from Hornsey High Street and reported to the unit in the grounds of Alexandra Palace. During the following twenty-four hours most of the 90th HAA Regiment mobilized. We were surprised to find that all the guns and command post equipment had been taken away, presumably transferred to another unit to bring that one up to scale. We were issued with blankets and told to sleep, if possible, on the hard dance floor of a nearby pavilion, located, in those days, across the road from the training huts. We had our meals in one of the restaurants and the civilian staff, still on duty, looked after us very well. On Sunday 27th August we went on our way, in commandeered buses, to a partly built gunsite in Essex. That was Ayletts Farm near Rainham. The concrete gun emplacements were almost finished, except for guns, and a few huts had been completed but not enough for the whole unit. Apart from the cookhouse, the men�s dining hut and administration huts there were a few others where officers and senior NCO�s slept. The Royal Engineers had erected rows of bell tents in the next field and that�s where the rank and file lived. There was great activity; extra kit issued included a palliasse, which is a type of mattress we filled with straw. They were quite comfortable, after the dance floor, while the straw remained fresh. The extra kit included a respirator, tin hat and groundsheet. We had become �proper soldiers�. The sanitary arrangements were extremely basic and this, along with the change of diet, resulted in upset stomachs and diarrhoea. A week later, on Sunday September the 3rd, war was officially declared. Someone heard the news on the radio and within minutes the air raid sirens sounded. There has never been any explanation for this nationwide alert as there wasn�t any enemy activity at the time, perhaps the government wanted to test the system. A soldier�s pay was two shillings a day (10p) and I arranged for half of it to be sent to my mother. The actual cash received across the pay table was sufficient for my needs; I didn�t smoke or drink at that time. The newly issued tin hats had another use. Taking out the lining and refitting the holding bolt turned the thing into a watertight bowl for morning ablutions. I had started to shave but my beard didn�t grow very quickly. The older men had a lot of trouble shaving in cold water. During the first few weeks we were kept very busy learning drills, aircraft recognition, small arms including the Lewis gun and, of course, cookhouse fatigues. I must have peeled enough spuds to feed the whole army, at least it seemed like it at the time. There were guard duties, not only around the camp but also at the Regimental HQ at Horndon on the Hill and at Brigade HQ in Stanford le Hope. Much spit and polish went into the preparation for these duties, everyone trying to be selected as the �stick man�, the odd man out who didn�t actually do two hours outside as a sentry but stayed in the guardroom, fetching and carrying for the others. I have good reason to remember the first Regimental Headquarters guard that I was on. One of my sentry periods, nine o�clock in the morning, coincided with the expected arrival of the Commanding Officer. He would walk down the road, I was told, from the officers� mess in a nearby hotel. As soon as he approached I was to shout �Stand by the guard� followed by �Guard turn out�. So there I was, a very nervous young soldier, gazing up the road to the hotel entrance. A uniformed man came out, service dress buttons gleaming in the morning sunshine. His Sam Brown belt and swagger stick made him appear every bit an officer of distinction. I gave the first order and could hear the guard preparing to come out for inspection. Why was the C.O. running down the road towards me? No one had told me to expect that. All was made clear when a red faced Regimental Sergeant Major stood in front of me and aired his views, as Captain Mainwaring of the television comedy series �Dad�s Army� would have said, �You stupid boy�. How on earth did he expect me to know what the C.O. looked like, this was my first guard duty at Head Quarters and I hadn�t been introduced to the people who worked there. Life in camp wasn�t too bad, a little monotonous and confining but this was war, after all. The midday meal was a good example; usually beef stew or for a change, stewed beef. Anyway we survived and actually had a half-day outing to the nearby town of Grays. An army truck took us and I spent my time looking in the shops and remember buying some writing paper and a tube of toothpaste. In October the unit was ready to move into active service, our first �battle station� was the world famous motor racing track, Brooklands near Weybridge in Surrey. You may ask why the defence of such a place was important to the war effort until I explain that there were two aircraft factories on the perimeter. Wellington bombers from the Vickers works and Hurricane fighters from the Hawkers factory took off from the grassed area in the centre of the five mile track and flew to RAF airdromes in different parts of the country. Our task, the defence of the whole area against enemy air attack. The concrete track, a vast off white strip stood out like a sore thumb, an easy target. How could it be camouflaged? Both factories used aluminium and the waste shavings were distributed over the track and sprayed with green and brown paint to look like bushes and trees. The Battery consisted of two Troops and the one I was in moved to Brooklands while the other took up a defensive position in the Kingston area, siting their guns on the roof of the Odeon cinema and a large department store. What weapons did we have, eight Lewis machine guns and a WWI Vickers water-cooled machine gun. The unit had not fired heavy AA guns, we were due to attend camp in the September war broke out, and couldn�t be trusted to use them, even though we had been taught to handle the mobile 3.7inch at the TA centre in the grounds of Alexandra Palace. Our first job was the creation of firing points, which meant digging holes deep enough to stand up in and still keep our heads below the sandbag walls. Each location consisted of two sections, the actual gun pit with a railway sleeper set in the centre to support the machine gun and a covered part for the crew to relax. Every gun position was different and there was a strong competitive spirit between the crews. They all had a fireplace to burn wood and furniture, which was either scrounged or home made. One of our sergeants sketched the inside of a dugout and it was reproduced on the unit�s 1939 Christmas card and this is a copy of it. A YMCA wagon came around each day and we could buy cups of tea and something to eat. I remember that they had Lyons individual fruit pies, much larger than the present day pie, and they always tasted wonderful. There were enough members of each crew to ensure full manning during daylight hours. The unit cookhouse and sleeping quarters were in the refreshment buildings at the top of �Test Hill�, a one in three gradient, and we had to march up and down it several times during the day. We didn�t have any difficulty sleeping on a hard floor after all the exercise we were getting. At the end of one particularly cold day we had a rum ration, something that was never repeated throughout my army career. Perhaps it was a very good thing that no enemy aircraft came over while we were stationed at Brooklands but we did see a number of Wellington bombers return for repairs following a raid on Germany. On Christmas Day, 1939, the lower ranks, I was a gunner at that time, experienced one of the better traditions of the British Army. No reveille and early morning tea brought round by the sergeants. Later, when we were all seated at the dining tables, the officers and senior NCO�s served the turkey dinner and plum pudding. Behind the scenes I believe they also helped with washing up. After the war, when I was a sergeant, I remember performing this annual ceremony myself. In January the Battery handed over to another unit and we moved to Wales for our firing camp. The arrival at Towyn railway station was like something from a vaudeville production. Our bedraggled appearance was heightened by a variety of different uniforms; we were in the process of changing from service dress to the new battle dress at the time. There were forage caps, peak caps and some soldiers without any headgear. Many of the lads carried gum boots slung around their necks and most surprising of all was the Battery Clerk, a bombardier, walking down the platform with a gold-fish bowl complete with two inhabitants swimming about. Needless to say this didn�t go unnoticed and at the following morning�s parade we were given a thorough dressing down and told to wake our ideas up or face the consequences. We were billeted in the town and travelled every day, by train, to the practice camp at Tonfanau, some five miles up the coast. I worked as a telephonist, taking and passing messages, not a very difficult job. The rest of the Battery either worked on command post instruments or on the 3.7� guns. They fired at the target sleeve towed behind an aircraft as it flew across the sky over the sea. I suppose someone gave points out of ten for near misses. I think we remained at the practice camp for three weeks before leaving Towyn station, all properly dressed and inspected, for a journey to Sussex and our first real gun site. Or so we thought! We arrived at the south coast town of Littlehampton and formed part of the air defence for the area, which included the Fleet Air Arm Base at Ford near Arundel. We often saw biplanes fly over, the famous Swordfish and the Walrus, an amphibian aircraft. The site had only just been completed and was located on the grassed area beside the promenade. There were two 3inch naval guns, converted for HAA, a Vickers mechanical predictor, height finder and an instrument called Telescope Identification, used by spotters. There were no sandbags and a single strand of rope kept the general public away. On the promenade side people could walk in front, except when we were drilling. On those occasions wooden poles, supported on triangular metal frames, had to be moved across the prom to stop people walking in front of the guns. There was a telephone line to the operations room (AAOR) at Tranmere, which terminated in the site plotting room. To call it a room is rather a grandiose expression, it was actually a commandeered bathing hut positioned beside the promenade. When I was the telephonist on duty I could manage to sit beside the phone and write messages. The plotting board was fixed on a wall alongside and it was also our job to write up aircraft plots with a chinagraph pencil. Each individual plot had to be prefixed with the letter �F� for friendly, �U� for unidentified or �H� for hostile. Sometimes an additional letter �X� indicated that the plot had originated from a radar source, though we didn�t know the significance at the time. The method for calling the unit into action was a simple bell push connected to a number of alarm bells in the billets. Our billets were in the large houses on the town side of the grassed area. Before the war these would have been family homes but today they display boards inviting visitors to stay at �Seaview Guest House� or �Hotel Sycamore� and the like. Of course the houses were empty when we were using them, sleeping on the floor as usual and using another property as a cookhouse and dining room. Another house accommodated our officer and the sergeants in slightly greater comfort. We stayed at this site for about three months and got to know the locals quite well. There was a small caf� just around the corner and I remember being able to get food and drinks at reduced charges. It was very nice to sit quietly and forget normal routine. The pavilion was still in operation and we attended a few dances there. It was only a hundred yards or so from the site, within easy running distance in an emergency. We were still in the period which has become known as the �Phoney War� and the general public were not going to be done out of their Easter Bank Holiday outing to the seaside. It was quite a nice day and some brave souls were actually bathing while others stretched out on the sand. The nearby fun fair was in full swing with screaming youngsters shooting down the big dipper accompanied by a mixture of sounds from the various sideshows. At around eleven o�clock we were notified of an unidentified aircraft approaching Littlehampton and our alarm bells started ringing. The men grabbed tin hats and respirators and dashed across the grass to get the site ready for action. The promenade to the front of the guns was cleared and the barriers erected. Within minutes the entire site was surrounded by hundreds of holidaymakers pushing and shoving to get a clear view of men in khaki preparing their equipment. Children stood, wide eyed, beside the rotating guns, some sucking ice creams or chewing candy floss. I will never forget what happened next; it was rather like play-acting on a film set, serious but nevertheless comical. Our troop officer, Lt..Vidler, a short and rather rotund gentleman, wearing riding breeches and highly polished boots, moved to centre stage. He turned to the crowd and said, �Ladies and Gentlemen we have just received report of enemy aircraft approaching from the south. These guns are likely to open fire at any moment. I strongly advise you to move back and please keep your children under control�. I think that everyone, and that included the soldiers, expected him to take a bow or give an encore. Nothing happened, which was a good thing, as I cannot remember seeing any ammunition on the site. Shortly after this episode the gun position was dismantled and moved nearer to the airfield. 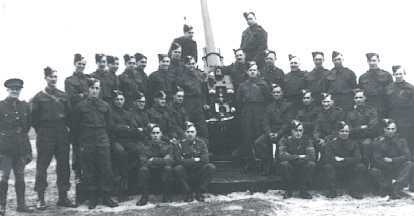 At the same time I was selected for training on gun laying equipment (renamed - Radar) and travelled, by myself, to Essex. 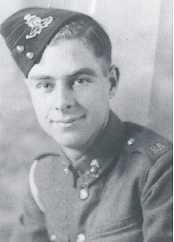 During my service in Freetown, West Africa, I had several bouts of malaria and one of them occurred in December 1942. This time I stayed in the 51st General Hospital and was there for Christmas. The hospital consisted of a number of ward huts, spread out around a quite extensive garden area. On December 24th, just after sunset, which in the tropics is six o�clock, a party from the naval barracks in Murrytown came around to sing carols for us. They parked their truck alongside the ward I was in and, while one of the men played a small organ, the others sang the traditional words of �Oh come all ye faithful� and �Hark the herald angels sing� and other well known carols. We didn�t notice the usual noises of the night, the crickets and the buzzing of mosquitoes. We were too engrossed, patients and staff listened quietly as the choir continued to sing. When the carols ended a single voice, a baritone, gave a solo performance with two well known ballads. The first �Because� has been sung by many, Sir Harry Secombe among them.